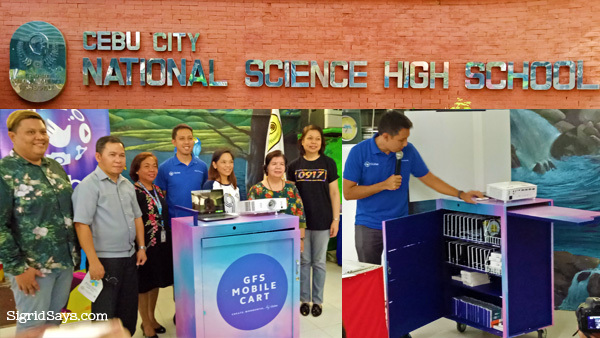 Cebu City National Science High School receives a GFS mobile cart from Globe. 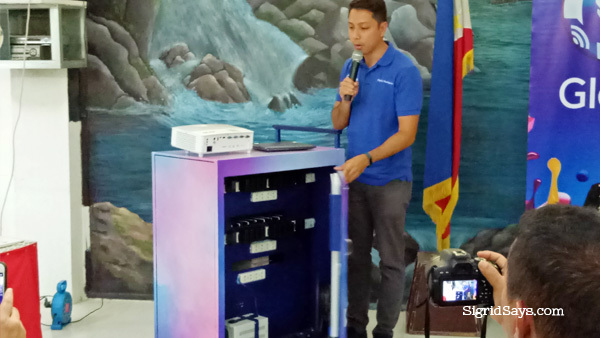 Globe’s GFS program provides select public schools with infrastructure support and ICT equipment such as the Globe Digital Learning Lab. 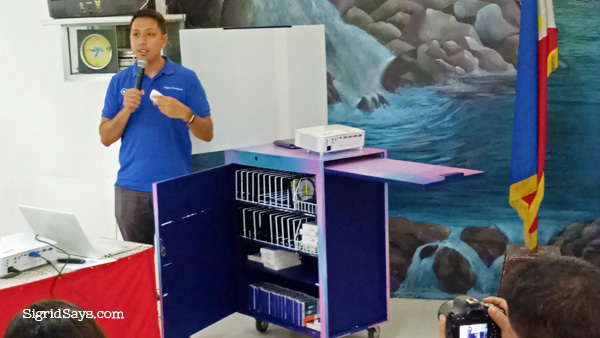 The Globe Digital Learning Lab is a mobile cart of ICT gadgets composed of netbooks, tablets, and projectors that are, of course, powered with superior internet connectivity. The Lab is equipped with what’s necessary to teach different subject matters whether inside or outside the classroom to encourage creativity, communication, collaboration, and critical thinking. 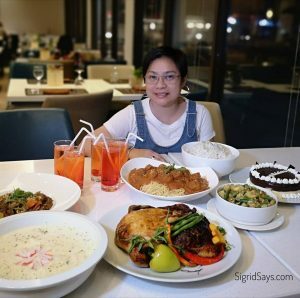 The turnover was headed by Globe SVP for Corporate Communications Yoly Crisanto. Aside from the hardware, the program also includes a teacher training component to empower the teachers with teach skills needs to make use of the ICT tools efficiently in their subject of expertise. In turn, the schools under the GFS Program serve as a teacher training hub for the Department of Education and are responsible for carrying out teacher training to neighboring schools. CCNSHS has 38 teachers and 1,004 students. 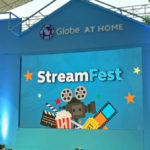 So Globe turned over a mobile kit that contains 20 tablets with mirroring capability for projectors and LCd screens, two projector kits with projector screen, 10 Globe Prepaid Supersticks, one mobile cart that also serves as a charging station, and free 10 mbps internet connection. CNNSHS is the 10th school in the Cebu province to benefit from the GFS Program of Globe. All over the country, 142 public schools are now under the GFS. The program keeps on evolving as technology advances, based on the needs of the school. 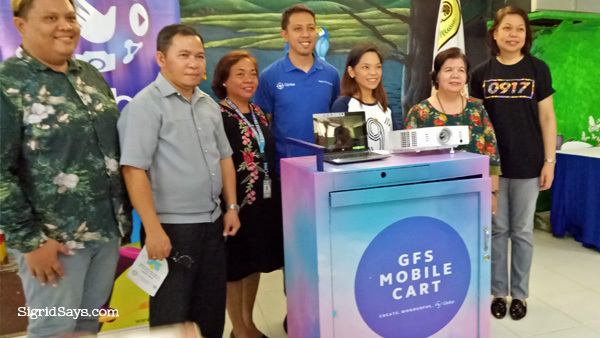 The GFS Mobile Cart contains a laptop, 20 tablets, two projector kits with projector screens, 10 Globe Prepaid Supersticks, and a cart that is also a charging station. Mr. Miguel Bermundo of Globe presents the cart to the media. Behind all the gadgets is of course a charging station to power up the gadgets. At present, there are still many public schools that are missing out on the benefits of ICT, which led Globe to help address this concern through the GFS. When the program started in 2012, Globe set out to transform at least one school in each of the 221 school divisions under the Department of Education into centers of ICT excellence within the coming four years. Based on the impact assessment released by the Taylor Nelson Sofres (TNS) Global Market Research Company last year, digital skills among teachers and students particularly on the usage of mobile technology and computer software, showed marked improvement as a result of the GFS program. Students also become more well-rounded due to increased engagements driven by the many indicators under the 21st Centry Learning Framework. Globe also held a Digital Thumbprint Program (DTP) Training for 44 ICT coordinators of the Mandaue City School Division held at the Mandaue Science High School last June 29. The coordinators, representing 42 public elementary and high schools in Mandaue City, will in turn conduct DTP workshops for students in their respective schools. Through the DTP, the desired outcome is that the students will learn about the responsible use of technology, either with the use of gadgets, website browsing, or in the use of social media platforms. 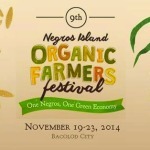 This will help them avoid social media mistakes or become victims of cyberbullying and cybercrimes. DTP offers three exciting modules for students. Each module is designed to increase the students’ knowledge of digital citizenship and cyber safety by taking a critical look at their online behavior. The program will also help the young people develop insights into the influences of the online world and the choices they are making. Different activities aim to teach students many different things. Activities of Digital Insight workshop are designed to help students discern proper online behavior while Digital Impact tackles issues on technology’s impact on students’ social activities. Meanwhile, Digital Ambition equips them with skills on how to use technology to achieve their life goals. 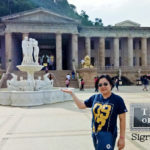 All these developments come in the heels of the expansion that Globe is undertaking in Cebu to raise their broadband and mobile internet connectivity.